U.S. Sen. Patrick Leahy of Vermont, the ranking Democrat, responded quickly. “Recusal is not discretionary,” Leahy said. “It’s required by Justice Department regulations when you have a political relationship with the president and the president has specific and substantial interests in the investigation.” The exchange raised the legal question: Under what circumstances must a prosecutor recuse himself from a matter? 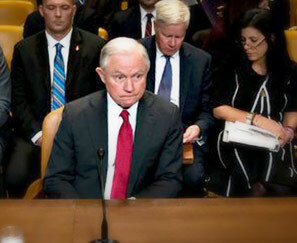 During his confirmation hearings in March 2017, Sessions promised senators he would recuse himself from oversight of all campaign-related investigations, including the examination into Russian interference in the 2016 election and purported Russian ties to Trump associates. The late April exchange between Sessions and Leahy stems from that promise, and whether the Cohen investigation is distinguishable from the Russia probe. Prior to Sessions’ testimony in April, news reports indicated that the attorney general had decided he would not recuse himself from matters involving Cohen although he might take a step back from certain areas. As the nation’s top prosecutor, Sessions has wide but not unlimited latitude to make those decisions under federal guidelines. Federal regulations [Title 45.2] require “disqualification arising from personal or political relationships.” The regulation stipulates that except in certain exceptions no Justice Department employee “shall participate in a criminal investigation or prosecution” where a personal or political relationship exists. But the fact that individuals belong to the same political party or share social or philosophical ties traditionally has not created sufficient grounds for a conflict of interest. Because of his role in Trump’s campaign and his seemingly contradictory statements about meetings with Russian diplomats, Sessions’ analysis led him to recuse himself in matters related to the investigation by special counsel Robert Mueller. But the probe of Cohen, which is led by the U.S. Attorney’s Office for the Southern District of New York (SDNY), offers a different set of facts for a decision on recusal. If the SDNY investigation focuses on Cohen’s past business practices and has nothing to do with the Trump campaign or the Russia investigation, Sessions could decide not to recuse himself from matters that come to his attention, even if the probe brushes up against the president. But, if the Cohen investigation intersects with the campaign or the Russia probe in some way – such as election law violations or money laundering – Sessions might have to reconsider his status based on Title 45.2. That would also be true if the attorney general has some personal knowledge and connection to the Cohen case that might cause him to be a witness.